Is your hen a bit football mad? Looking for an exciting twist on her favourite sport to add a little quirkiness to her hen do in Barcelona? 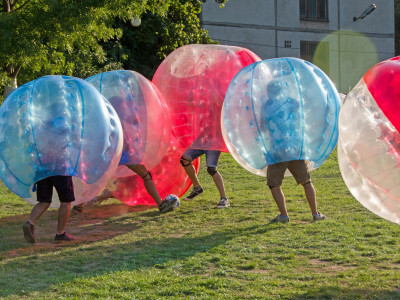 You can’t go wrong with Bubble Football! You might have seen this before, and yes… It is as fun as it looks! Bouncing around and trying to compete for the same ball is hilarious and never gets old! Of course, you’ll have a bubble football referee who knows all the rules! Not only is this guaranteed to be insanely funny, it’s a great equaliser… If you have one girlfriend that plays like Hope Solo, don’t fear… You’ll be just as good as her for the hour you play!